Filipinos have their own unique way of celebrating the Christmas season. While Western countries have mistletoe, eggnog, and stockings hung over a fireplace, they look forward to bibingka and puto bumbong, and festivities that start as early as October. The holiday season brings families together, and gatherings are made memorable with stories and laughter shared in front of sumptuous meals, games, and entertainment played by both young and old. Gifts are also exchanged as a sign of love and affection. Take some time to organize a musical interlude with loved ones. Music can be shared by everyone, and the bond and memories shared with family and friends while rehearsing, planning out costumes, or even going as far as caroling around the neighborhood, are reason enough to make an effort. Shopping for gifts for every member of the family is a daunting task, so try an alternative scheme like white elephant gifts or a raffle. By purchasing one grand gift to add to the pot, each member will get a chance to win something special. Raise the stakes with additional draws for gadgets and entertainment devices. The holidays bring the family together and are the best time to reminisce the year that was. Watch home videos and stay in touch of family members away from home and share in the simple pleasure of watching TV with loved ones. To make the Yuletide season more exciting, Samsung is offering up to 35% off on prices of select Full HD, Smart HD, UHD, Curved UHD, Premium UHD, and QLED TV models and Soundbars, when purchased through cash or straight card transactions. 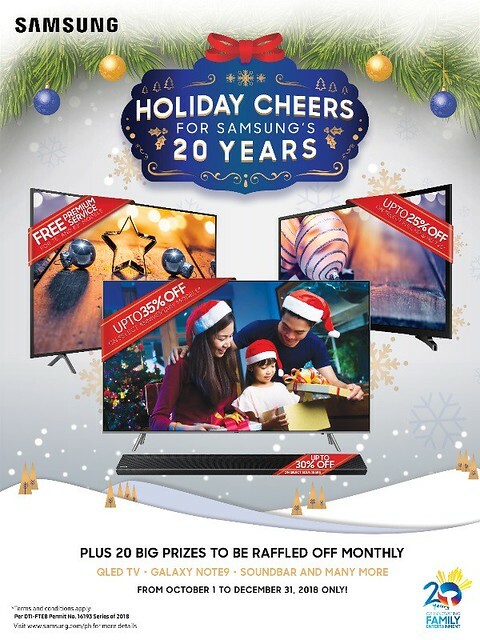 The ‘Holiday Cheers for Samsung’s 20 Years’ promo is the company’s way of saying thank you to its customers, as it celebrates its 20th year in the Philippines. The Holiday Cheers Samsung promo runs from October 1 to December 31, 2018, in all accredited dealer stores nationwide. The promo also features a raffle for customers who purchase participating TV and Soundbar models from October to December. Lucky winners will be drawn monthly and will get a chance to win either a grand package prize of a QLED TV, Soundbar, and a Galaxy Note9, or either of the secondary prizes: one of five 49” Smart TVs, or one of 14 Soundbars. Jolly Spaghetti’s Newest Video Captures Parent-child Bonding na Walang Kasing-sarap!